You wrestle them into long-sleeve shirts. You coax them into the shade with snacks. You slather their faces with sunscreen. Of course you’re aware of the skin-damaging effects of long-term sun exposure – and of course you go the extra mile to protect your family. But did you know that harmful ultraviolet (UV) rays can actually penetrate clothing and leave you vulnerable to sun damage? 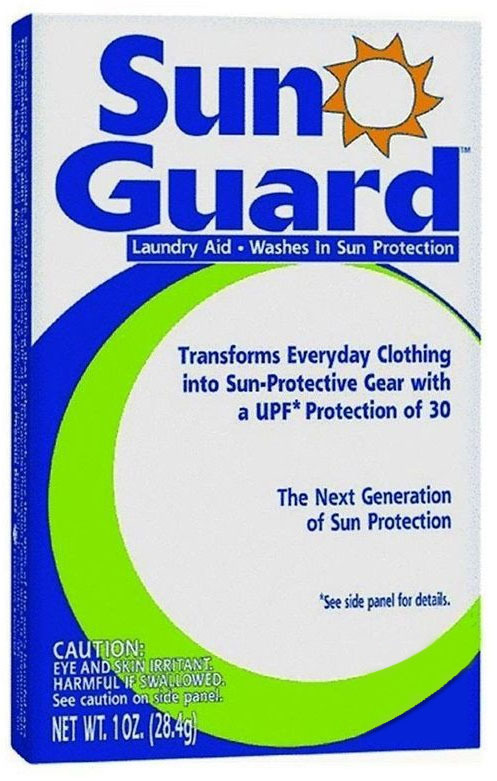 Enter SunGuard™ — an easy-to-use laundry aid that washes UV protection right into clothes Add one inexpensive package of SunGuard to a load of laundry, and you wash a skin-saving Ultraviolet Protection Factor of UPF 30 into every garment — and protect against damaging rays for up to 20 washings. The result? You and your family enjoy the comfort of wearing everyday clothing. And you’re comfortable in the knowledge that they’re better sheltered from the sun – even as they embrace the great outdoors.